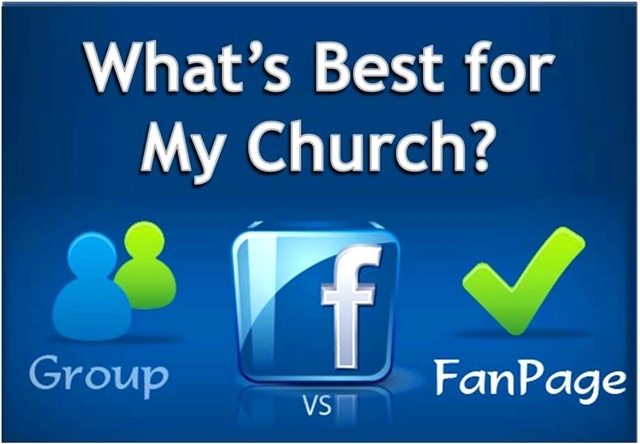 Recently the CTC Communications & IT (CommIT) team was asked our opinion on which is a better route for a church on Facebook – a fan page or a group. After replying, we thought that there might be more churches out there wondering the same thing. As such we thought we’d share our thoughts here. We welcome any insights, opinions or experiences that you might want to share on the subject as well and will amend this page with those insights as applicable. Basically the nutshell answer to this question is it depends on what you want to accomplish, but more times than not, a Fan Page (or Page) is the way to go. Without knowing anything about your churches social media strategy other than you’ve decided to have a Facebook presence and our over-arching mission of making disciples of Jesus Christ for the transformation of the world, a Facebook Page is much more inviting and welcoming to those folks looking to connect and learn more about what is happening at your church, community or the United Methodist connection in general. This is because Pages are open to anyone on Facebook, you don’t have to be “invited,” there is nothing to formally “join.” The biggest commitment anyone is making is taking the leap of faith to “Like” your page. Groups require being invited and approved by moderators and some can have limits on how many can be a part of the group. So if your Facebook presence is one of outreach and mission (and we know it is :-), a Facebook Fan Page is the way to go. This is not to suggest that Facebook Groups don’t have their place in your mission field. It’s just that Groups are probably best suited for specific events that your church/organization is having – like a family movie night or Young Adults retreat that people are going to sign up and attend anyway. Groups allow for specific info to be easily shared to a specific community – a community of people who are already involved and active in your ministries. The preceding has been a real broad view on a topic that is worthy of some much more in-depth discussion in many instances. Please feel free to contact the CTC CommIT team at ctc_CommIT@ctcumc.org with any questions or ideas. Pages allow real organizations, businesses, celebrities and brands to communicate broadly with people who like them. Pages may only be created and managed by official representatives. Groups provide a closed space for small groups of people to communicate about shared interests. Groups can be created by anyone. 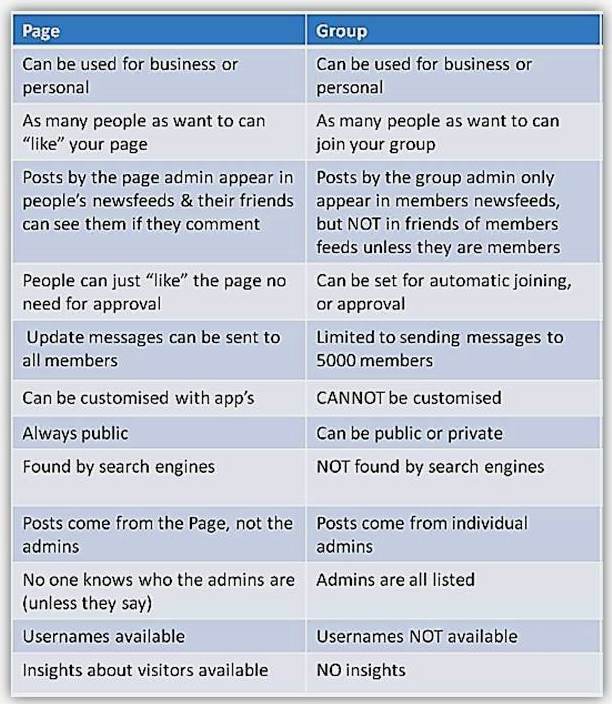 Privacy: Page information and posts are public and generally available to everyone on Facebook. Audience: Anyone can like a Page to become connected with it and get news feed updates. There is no limit to how many people can like a Page. Communication: Page admins can share posts under the Page’s name. Page posts appear in the news feeds of people who like the Page and their friends. Page admins can also create customized apps for their Pages and check Page Insights to track the Page’s growth and activity. Privacy: In addition to an open setting, more privacy settings are available for groups. In secret and closed groups, posts are only visible to group members. Audience: Group members must be approved or added by other members. When a group reaches a certain size, some features are limited. The most useful groups tend to be the ones you create with small groups of people you know. Communication: In groups, members receive notifications by default when any member posts in the group. Group members can participate in chats, upload photos to shared albums, collaborate on group docs and invite members who are friends to group events. Your Social Media Strategy Fully Embraces the World’s Second Largest Search Engine, Right?